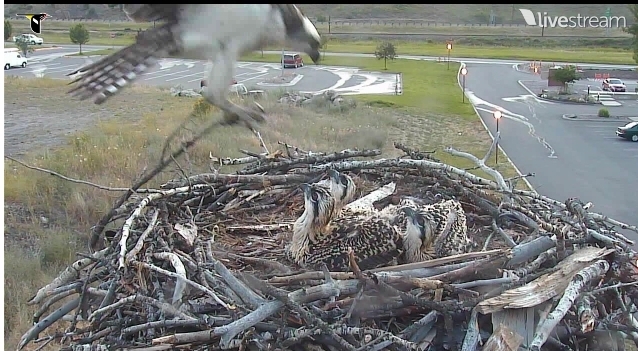 Checking in this morning on the Montana Osprey - look how they've grown! 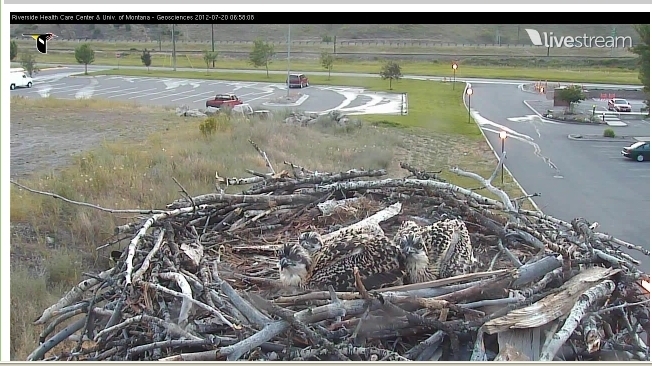 Their feathers have a distinctive buffy edge, which will help in camouflaging the juveniles, and will wear through the course of their activities after the leave the nest. 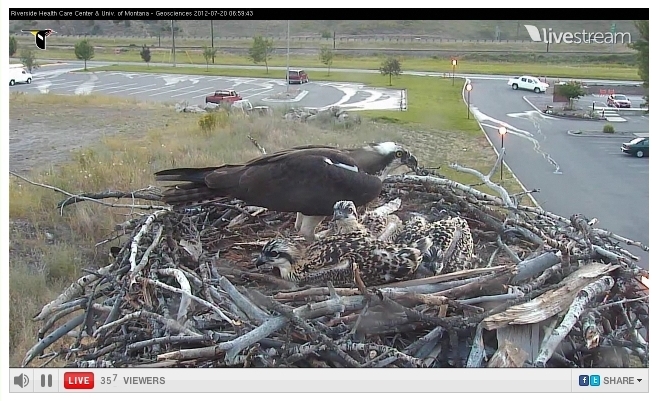 The parents are very actively bringing fish into the nest, as you can see from the screen shots this morning. Another camera to enjoy is this barn owl camera in Oceanside, CA. 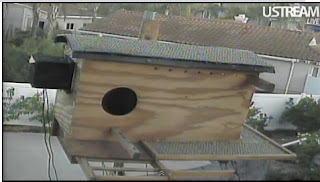 This owl box is (pictured here) 16 feet above the ground in the owners back yard which is near acres of open wilderness. 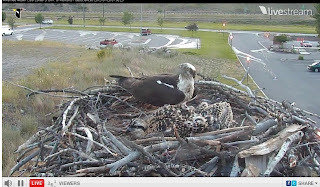 The first clutch was this past March, and the pair (named Mel and Sydney) have been spending time in the box again recently. 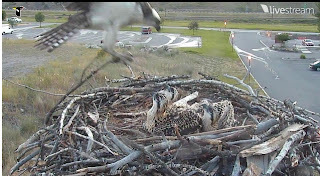 You can see a pellet here in the screen shot grabs from this morning. 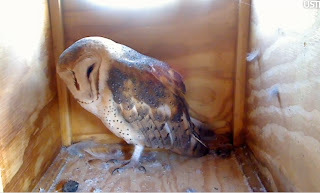 Barn owls and osprey are raptors that often make their homes in urban areas. 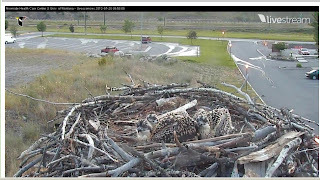 This intersection of wildlife and humans can sometimes result in injuries to birds as they encounter power lines, cars, windows and other obstacles. 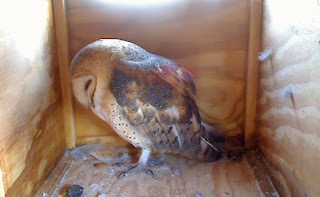 The Raptor Center is in a unique position to assist injured raptors with our experienced staff, as well as help educate the public on what they can do for, and understand about, raptors. Here is a FAQ page for how to help an injured bird. 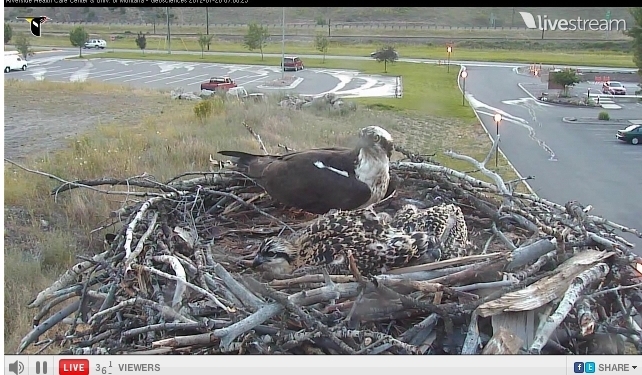 We have programs off and onsite to learn about raptors. Volunteering is a great way to be involved with The Raptor Center. Your support of all the opportunities provide for humans and raptors alike is always appreciated.